In just a few weeks Spurs have gone from title contenders to a real scrap for top four. Tottenham Hotspur blew a golden opportunity for three points today against Southampton at St. Mary’s Stadium. Up 1-0 after a dominant first half, Spurs conceded second half goals to Yan Valery and James Ward-Prowse and fell to the relegation-threatened Saints 2-1. Harry Kane scored Spurs’ only goal, his 17th in the league and 200th of his career for club and country. Tottenham started with a moderately rotated side. The good news: Tottenham started with DESK! The bad news: The “S” wasn’t Son Heung-Min but Moussa Sissoko. Sonny was rested against the Saints, but Dele Alli made his first start since his hamstring injury a month and a half ago, along with Harry Kane, Lucas Moura, and Christian Eriksen. Eric Dier made his first Premier League start since his illnesses and Kyle Walker-Peters made a rare start on the right flank. Pochettino also opted to rest Toby Alderweireld, with Davinson Sanchez playing alongside Jan Vertonghen. Pochettino was in the stands, as he was serving the first of his two-match touchline ban for an altercation with Mike Dean after the Burnley match. The first half was all Tottenham. Spurs’ first chance came in just the third minute — Dele Alli got his first action, heading a ball from midfield Spurs’ first for Harry Kane to run onto in the box, but Kane dragged his shot wide. Kane had another chance just seconds later, but he juggled the ball off his shoulder and volleyed over the bar. Lucas Moura was playing a little deeper than usual, more in the midfield and earned Romeu a yellow card after being tripped while dribbling up the middle. The midfield was excellent in the early stages, with Kane, Alli, Eriksen, and Sissoko all combining well to carve up Saints’ defense. Spurs’ best chance came in the 21st minute but it wasn’t their shot — a Southampton block ended up ricocheting off the post and Spurs weren’t able to turn the rebound into the net. Danny Rose earned a free kick at the edge of the box in the aftermath, but Eriksen’s ensuing free kick caromed off the crossbar and out. Spurs got their breakthrough in the 26th minute, thanks to some deft interplay between Dele and Kane. On a three on three breakaway, Dele chipped Saints’ defense and found Harry Kane in the box. Harry made easy work of it, putting Spurs up 1-0 and scoring his 200th goal of his career for club and country in the process. 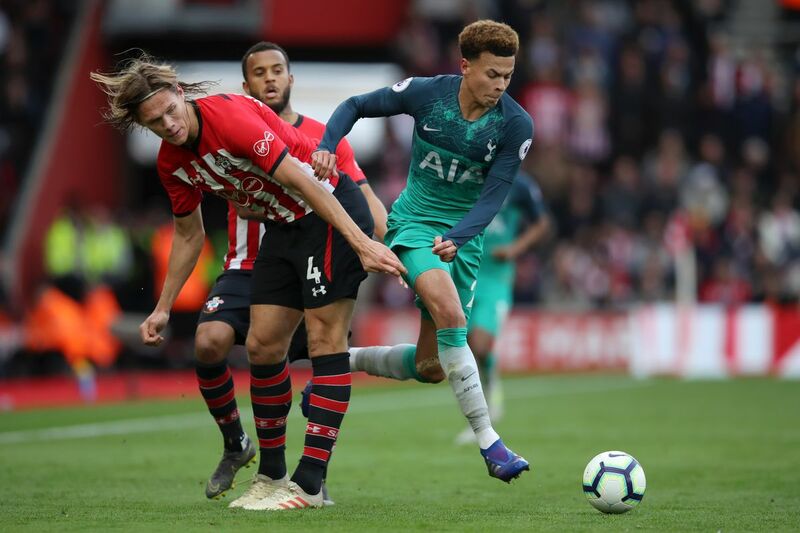 Dele wasn’t done, and he ripped a shot from the top of the box in the 30th minute that forced a good save from Southampton keeper Gunn, and Tottenham’s attackers continued to pick away at Saints’ back three, who were under an enormous amount of pressure the entire half. Eriksen had another look at goal just before halftime, a partially deflected effort that was punched down by Gunn. Spurs ran rampant throughout the first half. They rarely surrendered possession of the ball and didn’t allow Southampton to really do anything with it when they had the ball. Saints didn’t manage a single shot on target in the opening 45 minutes, and Spurs went in with a very comfortable 1-0 lead that could’ve been a lot more. Football is a harsh game sometimes, and mistakes can make teams pay. That’s exactly what happened to Spurs in the second half of this match. As good as Spurs were in the first half, they were equally poor in the second. Southampton manager Ralph Hasenhüttl knew he had to change things up at halftime, and he made a double sub at the break, bringing on Shane Long and Josh Sims for Oriol Romeu and Charlie Austin. The change resulted in the Saints’ first shot on target just a minute into the half, though the chance was smothered by Hugo Lloris. Saints had another half chance on a cross to Long just after, but he mistimed his header and Spurs scrambled the ball away. Saints looked much brighter in the opening minutes of the second half, keeping Spurs on the back foot, forcing two saves from Lloris, and finally getting the St. Mary’s crowd involved. Kane had another nice look from an acute angle on a Spurs counter attack in the 52nd minute, but Gunn got a hand to the ball and Spurs earned a corner. Perhaps Southampton’s best chance of the game up to that point came on a busted play and a counter-attack in the 56th minute. Nathan Redmond found himself with the ball and a good angle on Lloris, but he thankfully only found side-netting. Five minute later Hojberg went close again, firing just over the bar as Southampton continued to look for the equalizer, and Redmond went close again, putting a close-range effort inexplicably wide of the post. Kane had his eighth shot of the match in the 69th minute, putting a curling effort high and wide, and on the ensuing possession Eriksen nearly found Lucas with a chip over the back line. Spurs finally made their first sub of the match, with Son Heung-Min coming on for Lucas Moura in the 71st minute. Shane Long was also subbed off with an injury for Saints. Southampton finally, and deservedly, got the equalizing goal in the 77th minute courtesy of Yan Valery, who got open at the back post to fire home a cross that skated across the face of goal. And Saints made it two four minutes later after Kyle Walker-Peters clipped the back heel of Stuart Armstrong. It could easily have been a sending off for denial of a goal-scoring opportunity, but Kevin Friend only gave a yellow card and it was a free kick at the edge of the box. Ward-Prowse fired home the free kick past Hugo to give Saints the lead. Just after the goal, Spurs made two subs, with Dele and Rose making way for Ben Davies and Fernando Llorente. It nearly got worse for Spurs after a scuffle ensued between Redmond and Sissoko — there was a “coming together” of heads in the scrum and both men received yellow cards. Sissoko, however, was lucky that Kevin Friend didn’t send him off for his role in the incident. Sissoko nearly got the equalizing goal with a shot on target in extra time, but it was blocked out for a corner that was easily collected by Gunn. Spurs were pushing forward with desperation in the final minutes of extra time searching for that opening, but it never came. The whistle blew and Spurs fell at St. Mary’s Stadium, with the final score 2-1. This was a story of two halves — the first utterly dominant by Spurs, the second much, much less so. Southampton’s halftime subs clearly changed things as Spurs’ midfield began to tire, but Spurs’ defenders also made some really poor plays. It was a shocking defensive performance by Spurs in that second period. How good is Dele? Holy smokes. Spurs looked infinitely better with him in the side, and his presence both occupied midfield space and also helped unlock the creative abilities of Kane and Eriksen. He’s best-in-the-league-quality good. Pity he got gassed midway through the second half — his effectiveness waned as the match went on and he should’ve been subbed off a lot earlier. Lucas Moura had a really nice first half. Part of it was the ineptitude of Soton’s defense, but he was able to carve through the back line and looked really dangerous. Kyle Walker-Peters, however, had a nightmare and was at responsible for both of Saints’ second half goals, first by losing Valery at the back post and then clipping Armstrong setting up the free kick. He’s not great! I am struggling to understand how Spurs let Saints come back so strongly after the first half. Pochettino/Perez deserve some of the blame for not making key subs, especially in the midfield which was one of the keys to the second half. This is a bad result, folks. Real, real bad. With a trip to Anfield coming up, it’s safe to say that Spurs are now in a dogfight for top four. Looking forward to not watching this team play for the next three weeks. You have to watch this Tottenham Champions League locker room celebration video A look inside the locker room of the Champions League semifinalists. Five things we learned from Manchester City 4-3 Tottenham This is a match rife with talking points. Here are just a few. Moussa Sissoko didn’t know Spurs had made Champions League semifinals until staff member told him in dressing room There is only one Moussa Sissoko! Pochettino: Spurs tired but happy after Champions League win Spurs will assess a number of injured players, and it’s likely Poch will rotate ahead of Saturday’s Premier League match against City. City 4-3 Tottenham: Llorente goal sends Spurs to Champions League semifinals after insane second leg After a ridiculous game, Spurs are through to the semifinals of the Champions League!